Does Boiled Chicken Build Muscle? Building muscle mass requires a combination of proper exercise and diet. Many bodybuilders eat food that contains the maximum amount of protein countered by a minimal amount of fat. Boiled chicken is an ideal muscle-building food in that it strikes a balance. While it might not be the tastiest method of preparation, boiled chicken hits the spot when it comes to building muscle mass. In addition to a combination of resistance exercise and adequate caloric intake, building muscle requires sufficient amounts of protein. The body doesn't store protein efficiently on its own, so if you're trying to build muscle mass, you need to add protein through your diet. The amount of protein required to build muscle depends on your weight and existing muscle mass, but you generally need to add 10 to 14 grams of protein to your daily food intake to build 1 pound of muscle per week. 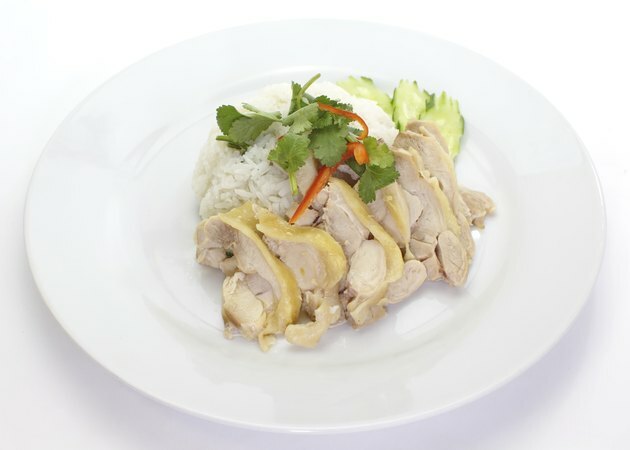 Boiled chicken is an effective way to add protein to your diet without excessive fat or cholesterol. A 3-ounce piece of skinless chicken breast contains 29 grams of protein, more than an equally sized piece of top round beef, turkey breast or salmon. Boiled chicken is favored by many bodybuilders for its high protein content and ease of preparation. Boiled chicken tends to be bland. And while it may not be a favorite with chefs, it is ideally suited for bodybuilders. Boiled chicken has less than one-third of the calories of fried chicken. A typical piece of boiled chicken has 81.6 percent protein and 18.4 percent fat. A similarly sized piece of fried chicken contains 46.5 percent protein and 53.5 percent fat. Because of the high fat content, fried chicken is not the best choice for those trying to build muscle. Chicken is rich in niacin, a B vitamin known to help prevent cancer. Chicken also is a beneficial source of another cancer-fighting nutrient, selenium, which helps maintain strong immune function and healthy metabolism. Each helps maintain overall health, which is critical when trying to increase muscle mass.